It's been a while since I finished watching the InuYasha series. While I will never consider it one of my all-time faves, InuYasha is definitely an anime that is worth watching at least once. The movies for the series, much like movies for just about every anime series, are kind of hit and miss. The first two movies were not that spectacular. Much like many of the early Dragonball Z movies, they felt like episodes that had simply been elongated. That, to me, feels like a wasted opportunity. A movie should be a spectacle and should have the scope of one. InuYasha, to its credit, has a very fantastic world and a lot of interesting characters and in Swords of an Honorable Ruler we actually get a story that is more than just another overlong filler episode. If you know the storyline of InuYasha then that is a plus. If you don't then you need some studying up to do. Just go here to read my review of the series. Swords of an Honorable Ruler is an epic and action-packed anime movie. Even though it is over ten years old at this point, the animation is still pretty spectacular. Much better than the series prior to InuYasha: The Final Act. A blu-ray release would look spectacular, but for now I'll just keep my old DVD. One of the strongest things about the InuYasha series was the action, but that was critically underutilized throughout much of the series in favor of never-ending maudlin sentimentality. None of that is present in this movie, though. This movie is fast and mean and dark. The main premise of this movie goes back to the death of InuYasha's father and the three swords he claimed as his own. Fans of the series will recognize the fact that Tessusaiga and Tenseiga are the swords of the great dog demon, but there was actually another sword according to this movie. This sword is the great sword Sounga, but this sword was not carved from his fang. This sword's past is mysterious, but it somehow made its way into the possession of Inu no Taisho. After his death the sword was thought to be lost, but it is found again in the present time at the Higurashi family shrine by Kagome's grandfather. And it comes back to life. This sword has the ability to summon 100 dead souls with one strike and it wants to be in the possession of someone it can consume and use as a body. Sounga travels using InuYasha as a host from the Higurashi shrine in the present day to the feudal era of Japan, but the sword wants more than just to use InuYasha. It wants to destroy everything. InuYasha by himself is too weak to destroy it. 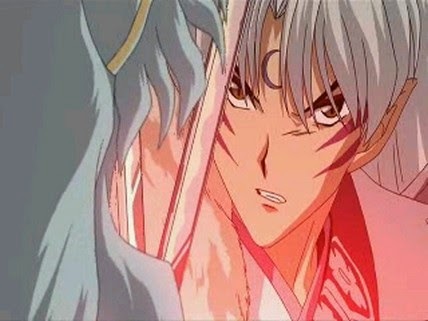 The only way he might stand a chance is if Sesshomaru, InuYasha's brother, decides to lend a hand. (I just made a hilarious pun if you are familiar with this series and/or this movie.) 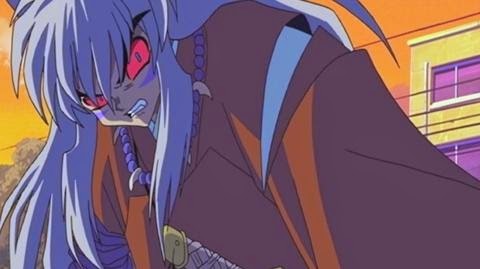 Of course, Sesshomaru would much rather just kill InuYasha then save him. This is a really good anime movie, considering that it is a series-related release. It's not Studio Ghibli or anything like that, but it is good in its own right and worth watching again and again. I've seen the movie at least four times, I think. If only the series had been as epic throughout its running, but when it was at its best it was pretty epic. Just like this movie.